Shrieks of delight would be the words to describe my reaction. I wore this to university on Monday, hence the rather large uni bag filled with everything. I bought this from Target in a rush on my way to uni one morning and was extremely happy with my $11 purchase!! This skirt is one of the most versatile pieces in my wardrobe and instantly dresses up simple t-shirts and tops. This one skirt can add so much interest to what could be an otherwise boring old black skirt. The top I'm wearing is a mens shirt that I picked up from a second hand store. It was originally a short sleeved collared shirt, but I cut off the sleeves and collar. It's very rare that I will wear a muscle shirt, however I love that college/varsity look that I've been seeing on style blogs. So when I found this little gem I whipped out the scissors and worked my magic. I love this whole combination! You're talented :). And I especially like that it's affordable/vintage. So great! <3!!! I love this look! 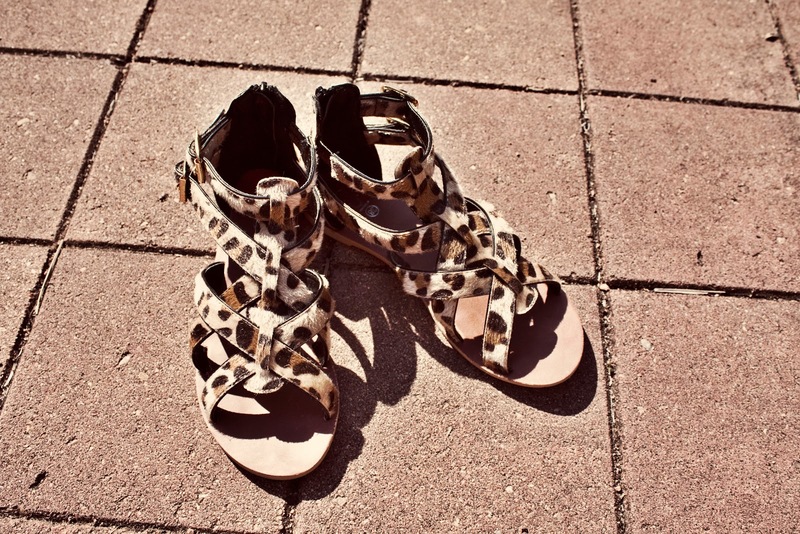 the leopard sandals are so adorable.